Is there ever really enough trap? Whether it's time to blast music to unwind, work out, or rage until the sun comes up, trap music has become quintessential for the ultimate playlist. Scotland's Show N Prove has brought an island infused track for the world today, and it's been on repeat all morning in sunny California. The young producer has recently moved to London and has been quickly gaining support from the likes of BBC Radio 1, as well as big name acts like Angel Haze, Mac Miller, and Professor Green, and this comes as no surprise. 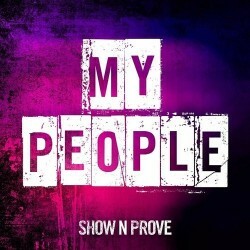 Not too intense that the workplace can't handle, yet enough to give me the kick my coffee wasn't able to provide this morning, "My People" is a warm song with strong energy. The producer wastes no time as he quickly builds in the track and gets to the drop fast. There is no dilly-dallying done here, and on a Monday, that's rather essential. While the song is probably not intense enough to be considered an US massive anthem, it is a catchy number that will stick in both your head and your iPod.